A must read! 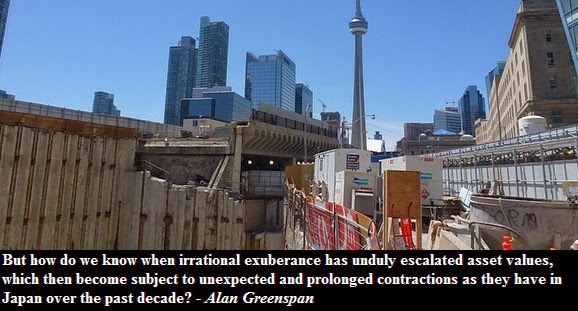 Is the Canadian housing market driven by fundamentals or by irrational exuberance? Researchers from Lancaster University have developed a test to see whether home price growth is based on sound economics or explosive and irrational behavior. Below I present a summary of their research as well as a series of graphs to illustrate the relationship between housing bubbles and periods of exuberance. The Fundamentals: What determines home prices? What drives real estate boom-and-bust cycles? Without a doubt mortgage rates, credit availability and industry practices played a major role during the last boom and bust cycles in the US, UK, Ireland, Spain and others. But those were not the main drivers of the bubbles. An alternative explanation pinpoints the possibility that the boom-bust cycles in the above countries were driven by an animal of different kind that occurs when investment into the real estate sector is miss-allocated and home prices rise by much more than the fundamentals would warrant. In other words, boom bust cycles occur because of explosive behavior - irrational exuberance. Explosive behavior may lead to periods of exuberance. Prices rise so high that they no longer reflect the underlying economic fundamentals. Instead the market is driven on the expectation of future price growth based on the past history of real estate appreciation. A new belief emerges that home prices will continue to rise in the future. The process of explosive behavior creates a boom bust cycle which is completely unrelated to the economic fundamentals. Is there any evidence to support this claim? You would be surprised! 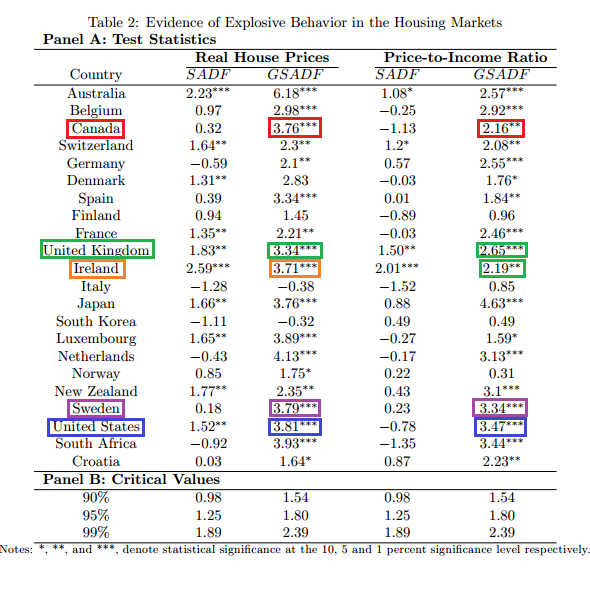 A working paper by Pavlidis (2013) examined the international housing markets for periods of exuberance using the new GSADF test. You can read the whole paper here and download the data here (Excel). You can also view a statistical presentation on which this blog post is based here. Below I created some sample graphs based on the data provided by Federal Reserve Bank to illustrate irrational exuberance in the USA, UK, Ireland, Sweden and Canada. Remember the housing bubble in the United States? The first graph shows the real home price index for the United States. The second graph shows the exuberance index - that is whenever US exuberance index (blue) passed the critical value (light blue) - the price growth was NOT REFLECTING FUNDAMENTALS. Now let's move to the United Kingdom. 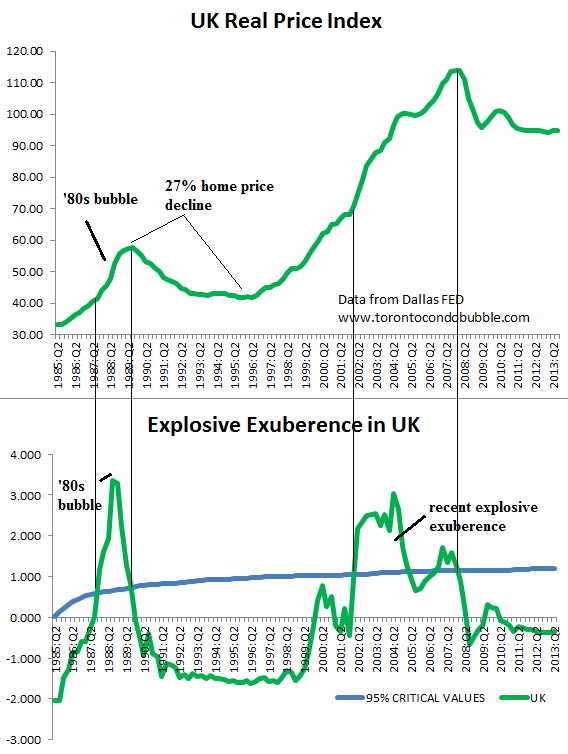 Notice how there was a housing bubble in the UK back in late '80s - just like in Toronto. 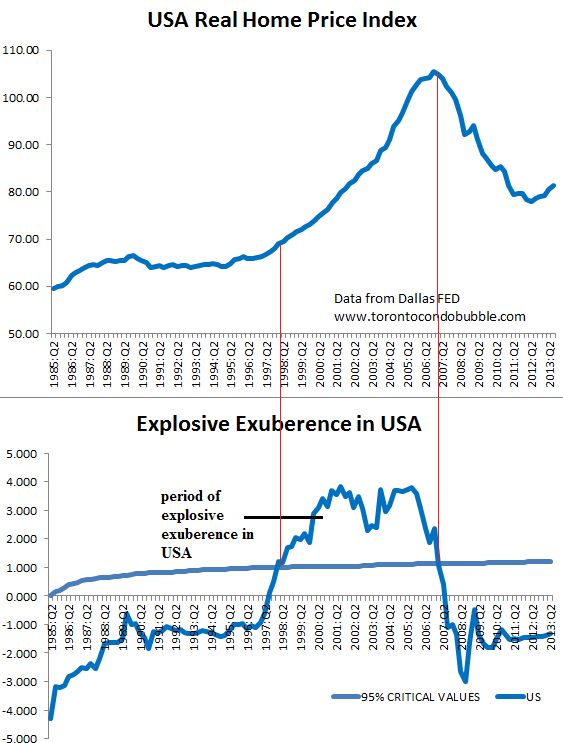 Interestingly the data points that indicate explosive exuberance were much stronger in the late '80s than in mid-2000s. 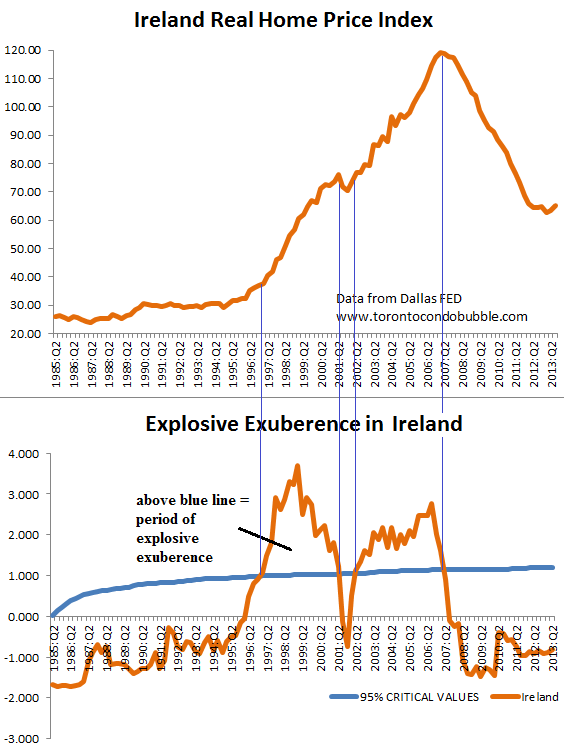 Ireland had an epic housing bubble. Again, the data from GSADF test points to two periods of irrational exuberance. One between 1996 - 2001 and second between 2002 - 2007. Just a few days ago Paul Krugman warned Sweden that they have a significant housing bubble. 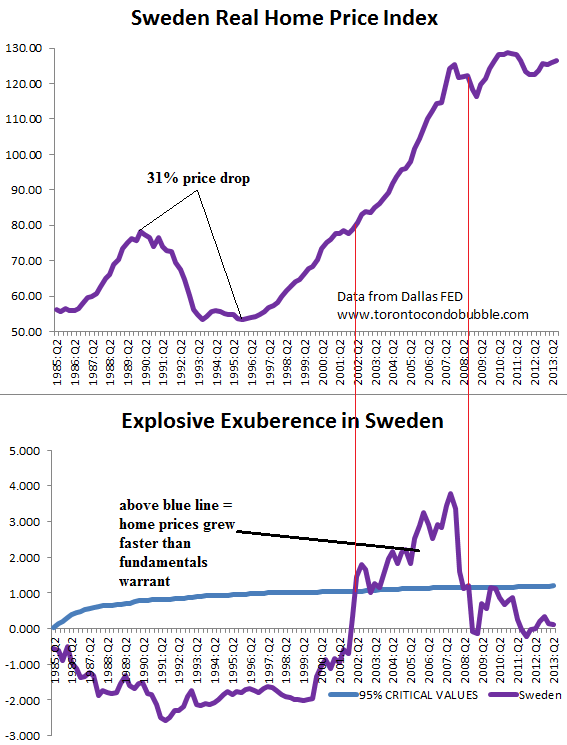 As in the above example, property prices in Sweden reached new heights - not because of strong underlying fundamentals but because of explosive behavior which led to a period of exuberance between 2002 - 2007. 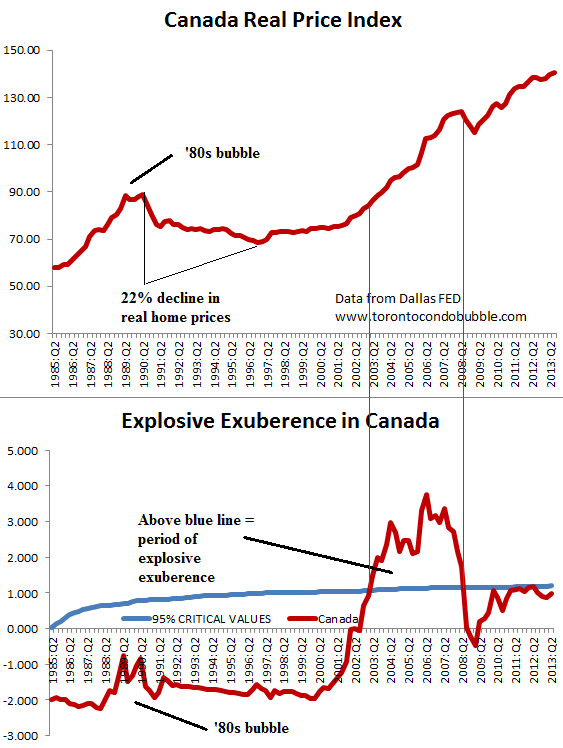 Finally let's take a look at irrational exuberance in the Canadian housing market. The data suggests that there was a period of exuberance between mid 2002 and early 2008 in the housing market. Does it mean that we already had a housing bubble back in 2008? I believe so. But don't just take my word for it. "There are local housing bubbles (in Vancouver, parts of Ottawa, and Montreal), but very little of this effect is related to sub-prime mortgages, rather to rapidly escalating property values." Note that the real home price index and the exuberance index is based on the Royal LePage data (bungalows + 2 story SFH) from 10 metropolitan areas: Victoria, Vancouver, Toronto, Edmonton, Calgary, Halifax, Montreal, Winnipeg, Ottawa, Regina. passes the blue line that means that it's 95% certain that home price growth was due to irrational exuberance and not due to the fundamentals. In fact the highest level of irrational exuberance for Canada was 3.76 with a 99% degree of certainty. Now take a look at the late '80s bubble (which was mostly restricted to Ontario). Notice how the relative degree of explosive behavior had jumped up but did not cross the blue line. That is probably because the bubble was mostly restricted to southern Ontario and cities which did not experience irrational exuberance dampened the effect on the national level. See all the city price graphs here. The reason that exuberance in Canada was high between 2002 and 2007 was because home prices were growing everywhere in the nation. But that is no longer the case. Today the national exuberance index is below the 95% blue line mostly due the fact that real home prices have fallen in places such as Edmonton, Calgary and Victoria. Thus, the national exuberance index doesn't reflect the true situation in each and every city. For example, prices in Toronto are still rising. Finally, the table below shows the highest levels of explosive behavior in various countries. Not surprisingly the level of exuberant behavior in Canada was almost as high as in the United States during the peak!